Although many of my main meals are vegan, I can never resist the allure of succulent paneer cheese for too long. 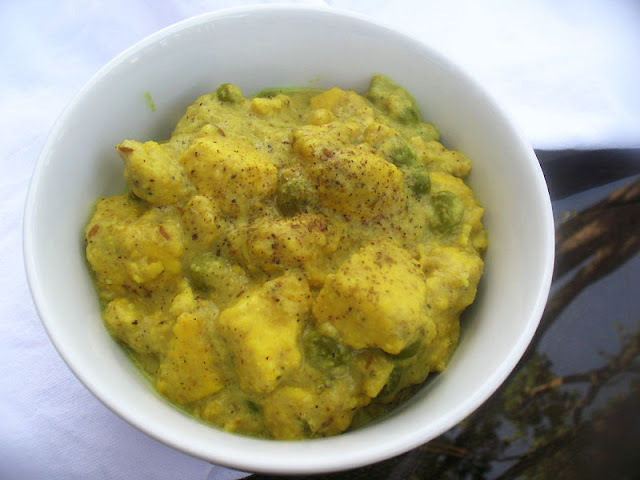 The cheese does not have a whole lot of flavor on its own — although I do enjoy snacking on little bites of it while I prep a dish — but paneer is a wonderful vehicle for taking on the spices and seasonings present in a dish. It has a texture much like firm tofu, but it's real cheese without the soya. There really is no substitute, but if you want to make it vegan, then use cubes of firm tofu instead. 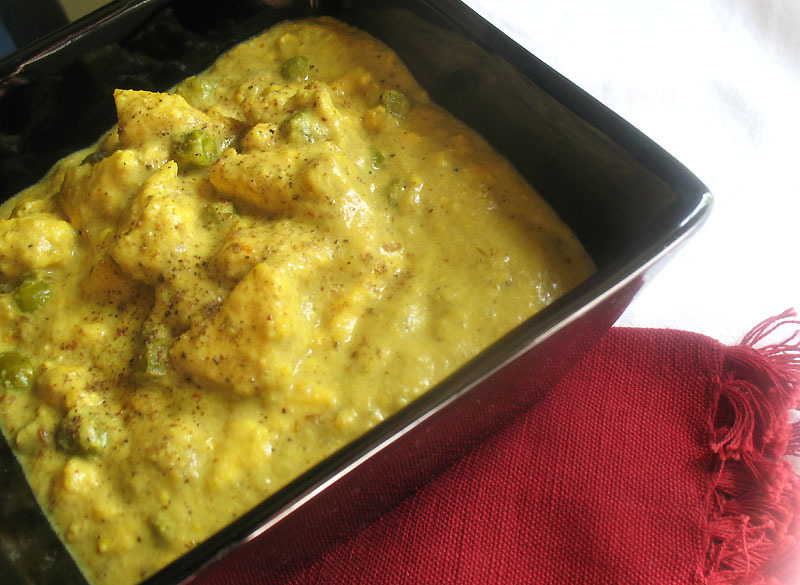 Traditionally, this dish of paneer cheese simmered in a thick flavorful onion and cashew gravy is made with cream or yogurt, but as there was already cheese in the dish, I decided to mix things up and use coconut milk instead to cut down on the richness. The coconut milk still resulted in a creamy gravy and it was just as delicious as dairy alternatives. It's such an easy dish to prepare and pan-frying paneer ahead of adding it to the dish is unnecessary in this instance. Just cube it and add it to the spicy gravy. As for the spice component, it on the lower side of the spectrum in terms of heat, but as always, most Indian dishes are forgiving, so adjust the spicing to suit your preference and add more onion to the paste if that is to your taste. Soak the cashews in hot water for 15 minutes, then drain. Combine the cashews, onion, garlic, ginger, chilies and a little of the water in a small food processor or blender. Process until you have a fairly smooth paste, adding a little more water as needed to help blend the ingredients. Set aside. Heat the oil over medium heat in a large heavy-bottomed saucepan. When hot, add the cumin seeds and fry until they begin to darken a few shades. Stir in the onion-cashew paste and cook, stirring frequently, for 5 to 7 minutes. Now add the black pepper, turmeric, ground coriander and amchoor powder if using and fry for another 30 seconds. Add the coconut milk and water and bring to a boil. Stir in the paneer, peas and salt. Simmer for another 8 to 10 minutes or until the sauce is thickened, stirring occasionally. Add more water for desired consistency. Remove from heat, stir in the garam masala, and let stand for 10 minutes or longer, covered, to allow the flavors to blend. Refrigerate leftovers for 2 to 3 days. Reheat at a low temperature with added water. I'm sharing this with Jacqueline's Meat Free Mondays. Each week Monday, Jac highlights some of the submissions from the week before. Yes, please! This curry sounds so amazing. 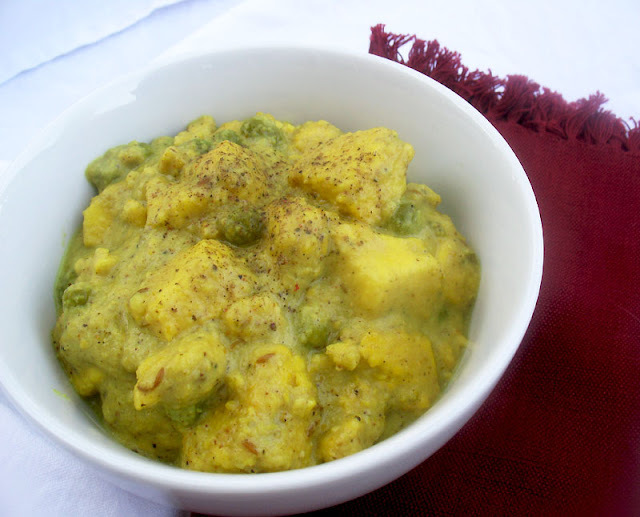 I need to get some paneer and give it a try! Paneer is one of my favorites! I've never seen it served with a coconut milk based sauce like this. Yum. Your photos always make me hungry. This is one I really should try with the tofu. I can smell the spices rising from the pan as I read. Thanks for sharing.